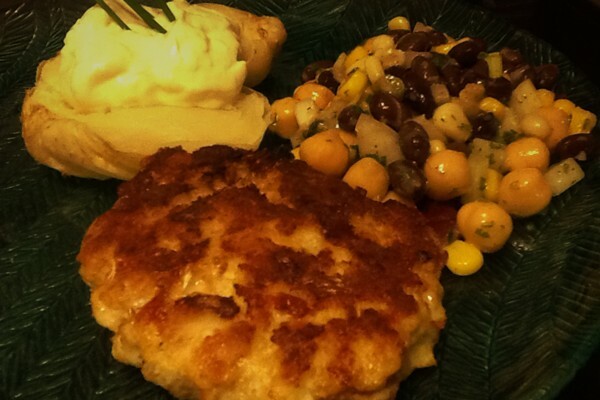 My mom makes this recipe for when she feels like something different than the usual fare. It’s also for those days you don’t want to put the oven on, or need dinner-in-a-hurry. 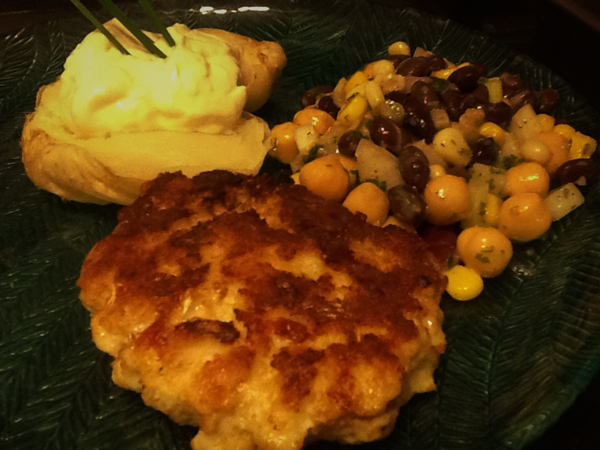 It’s a versatile recipe too, for crab cakes, just substitute faux crab which can be just as delicious nowadays as real crab, and if canned is even faster for prep. Egg is used as a binder thus you’ll need to keep that in the recipe. Can make smaller for appetizers. Can substitute gluten free bread crumbs, or regular bread crumbs for the spelt breadcrumbs. To make spelt breadcrumbs, just save your old crusts in the freezer and put them in the food processor when needed. Pat-dry the fish, finely chop and place in a medium bowl. Add shredded cheese, spelt bbreadcrumbs, salt, pepper, egg and onion, mix well. In a large non-stick skillet (or cast iron pan) melt butter over medium heat. Cook patties turning once, for about 10 minutes or until golden and fish is opaque. Can serve with tartar sauce or ranch dressing with a pinch of dill weed (or a 1/2 tsp of dill vinegar from the pickle bottle juice) added as dipping sauce. The side dish needs to be punchy – such as cole slaw, bean salad, ideally something vinegary, and french fries/chips are a good touch too.